The Mansfield family have always been entrepreneurial. Besides designing, building and remodelling homes, they run a dairy farm on the North Island of New Zealand. Diane’s mother is a well-known cheese maker with several books and videos to her credit. After graduating from Auckland's Unitec Institute of Technology with a degree in Furniture Design, Diane set off to explore the world. A working tour of Europe, eventually found her sharing her skills with the house proud English. Sixteen years after leaving New Zealand, Miss Fix It runs her thriving business from her workshop on the Surrey/Kent border. Very much a hands-on, home improvement expert, Diane partners with clients as a trusted consultant, spokeswoman, brand ambassador, designer, builder, carpenter, electrician, plumber and decorator. She is literally a one-stop-shop. 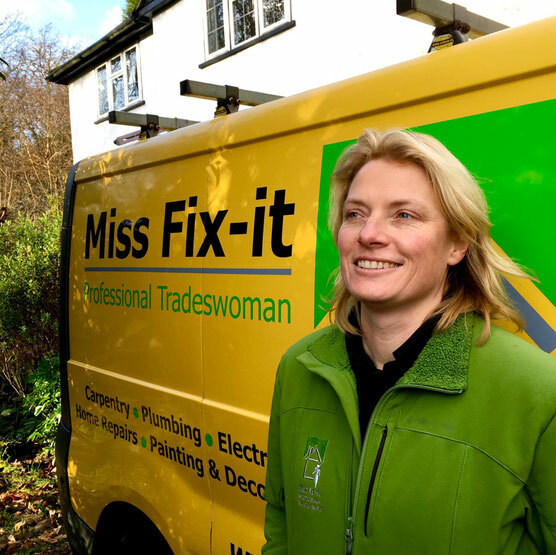 Other than handling gas and emergency call-outs, there are few jobs Miss Fix It won't tackle. 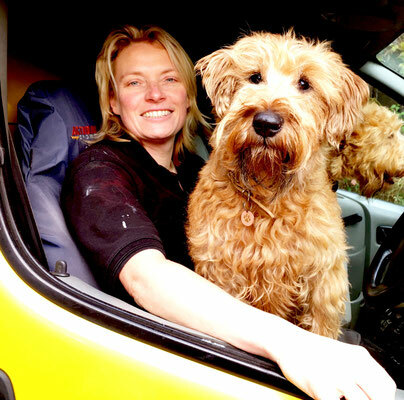 She designs and builds kitchens, bathrooms, utility rooms, and free standing studios, from the ground floor up. 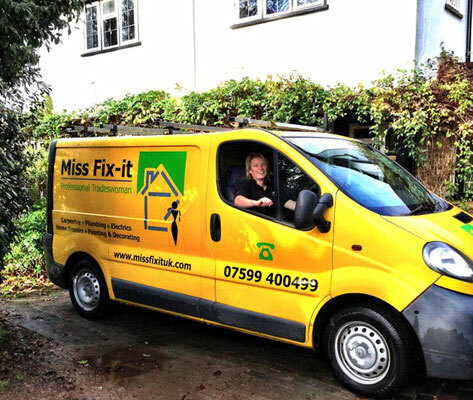 She paints, decorates, modernises, and customises homes within a 12 mile radius of Caterham, Surrey. 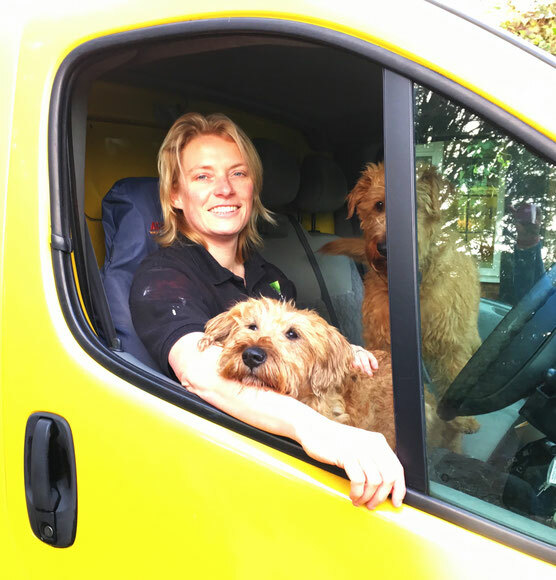 Her bright yellow van, sporting two Irish Terriers, is often spotted tooting about country lanes. 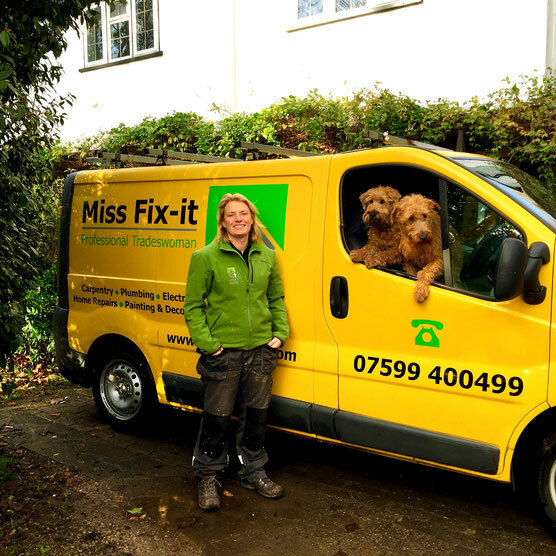 Enthusiastic clients refer to Miss Fix It as ‘Britain's Favourite Action Hero’ because of her remarkable versatility and dexterity. She springs into action on jobs that flummox homeowners and pros alike. Because her clients are not required to seek out three or four independent contractors for their projects, the whole process of working with Diane is a seamless experience. Once someone works with her, they become a client for life. © Diane Mansfield. All Rights Reserved.